Part of quality design is building functionality. In styling your bedroom, it is important to optimize your room for quality sleep, making it a sleep haven. Confidence starts at home; having the right sleep environment and sleep hardware is essential for building a warm, tranquil atmosphere. 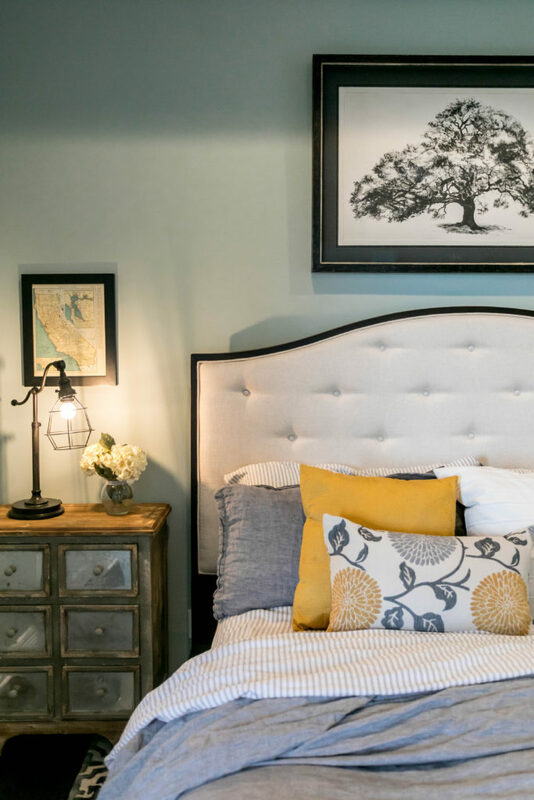 Whether you are designing on your own or using an interior designer for the first time, use the following tips to make your bedroom a sleep conducive setting, particularly if you have trouble falling asleep. As tempting as it is to scroll for thirty minutes through your social media while in bed before you sleep, think again. The blue light emitted from portable electronic devices will keep you up. Most LCD screens emit shortwave blue light directly into your eyes at close range, where blue light suppresses the release of the sleep hormone, melatonin. In fact, you may consider removing your TV, computer, and any other tempting electronic devices out of your bedroom altogether! Investing in what you sleep on is so essential to the quality of your waking life. Since we spend on average 27 years of our life on our mattress, investing in your mattress and bedding is worthwhile. The quality of your mattress can determine the quality of your sleep and if you feel rested in the morning, depending on if the mattress you sleep on is the right fit for your sleeping habits and your body. Your sleeping structure should be chosen based on performance, where it is not just another piece of furniture to buy. Do your research and invest in the right mattress for you. Also, it is worth investing in bedding that is comfortable, aesthetically pleasing, and sets the tone for your new and improved sleep environment! Another simple remedy for optimizing your bedroom for sleep is modifying the lighting in your room. Compact Fluorescent Bulbs (CFLs) give off a harsh, bright light, which can of course be issues when you are trying to sleep. The diffused, warm light given off by incandescent bulbs is much better. In fact, red light helps with melatonin production, so consider red bulbs for your lamps or a string of red lights for your bedroom. Since both natural and artificial light are natural suppressors of melatonin, consider a dimmable switch in your bedroom which gradually should be used over the hour before bedtime to help your body wind down for sleep time. Strive for total darkness in your room for when you are actually sleeping. Wall color is a quick, inexpensive way to transform a room, especially the mood. Light shades of blue are the best, where shades of yellow and green are a close second. Colors to avoid include shades of red, purple, orange, and brown. Cool colors like blue, green, and the cooler tones of yellow are known to calm and soothe, whereas warmer tones are known to energize and stimulate. Specific colors are also known to correlate with emotions – see color psychology. Another simple remedy that makes it easier to sleep is turning down the temperature. Your body in order to fall asleep must decrease in temperature by two degrees, so keeping your bedroom at a temperature between 65 – 68 degrees Fahrenheit is ideal. Remember that your body has to reduce its temperature by one to two degrees in order for it to be possible for you to fall asleep, where research shows that cooler temperatures impact your circadian rhythm in a positive way. You can reduce heat and reduce anxiety by adding a fan. The fan keeps the room cooler and also provides some soothing white noise. A bunch of clutter, like clothes on the floor, papers from work, and countertops loaded with unnecessary décor and momentos, all lead to increased stress levels and overloading the senses. Try a minimalist approach when deciding what to put in your bedroom and what leave out. Remember that your bedroom should be for sleep only, so focus on placing only sleep-related items in your bedroom that promote serenity. There should be no exercise equipment in your bedroom, as your bedroom should be a hub for rest, not activity. Another certain way to make your bedroom more sleep conducive is through taking active steps to rid your room of noise. Quick remedies to eliminate noise include purchasing a white noise, machine, ear plugs, or headphones. Turn off social media notifications on your mobile phone or tablet. Other simple suggestions include avoiding running appliances near bedtime. When you are setting up your home and where things go, make sure when you place your bed that it is not against a wall adjacent to the laundry room, for example. Adding real plants has a number of benefits. In addition to lowering blood pressure and reduce stress, they improve perceptions of space and overall wellbeing. Also very important is that plants have been shown to significantly reduce indoor air pollution through their ability to absorb household toxins. This ability helps prevent exposure to allergens in your house and other toxins that may hinder sleep quality. See the top ten plants for absorbing toxins in your home and bedroom. When moving into a new home or if you are looking to renovate and update your existing home, carefully evaluate your bedroom environment. Quality sleep is essential for living out your best daily life, so make sure your bedroom is as conducive to sleep as possible. You deserve a calm, serene sleep sanctuary in your home just for you!